The lastest dev profile features Tramell Isaac, SOE's Vanu loving Sr. Art Director. 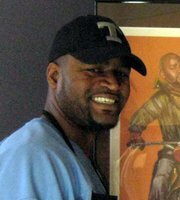 Tramell Isaac, Sr. Art Director SOE, is a 17 year veteran of the video games industry. He has served as Art Director on every Planetside retail product. Throughout the years he has lent his talents to a number of titles spanning multiple genres. Fallout, Fallout2, Ice Wind Dale, Never Winter Nights 2, and Duke Nukem Forever are listed as some of his accomplishments. Tramell returns to the Planetside franchise for another tour and a shot at gaming history; creating the world’s next greatest MMOFPS…Planetside 2. We often hear him in the halls saying VANU 4LIF SUCKAs!!!! Those of us who attended PSUMA had the pleasure of meeting T-Ray, as he is known. He's a nice guy and gave us a sneak peek at the Phantasm which he sketched out on a napkin at the Hard Rock Cafe in Orlando. I talked with T-Ray quite a bit, specifically about orbital command stations. He stated they'd actually done a lot of artwork on orbital stations and was frustrated that they hadn't gotten able to use the work as that stuff was placed on the back burner for other projects. I was glad to see his face in among the developers Hamma was pictured with the other week. That he's still on board tells me that SOE is willing to use some of the old talent that made PS so great! He's just as awesome now.